TF STAGE: Steven D. Hunt 5:30-6:45. Hurricane Hawk & The Invaders 7-8:15. Denny Artache Band 8:30-10. Steve Fredericks 10:15-11:45.. CK STAGE: The Groove Soul Band 5:30-7:45. East Harbor 8-10. Two Dad Doodad 10-2am. 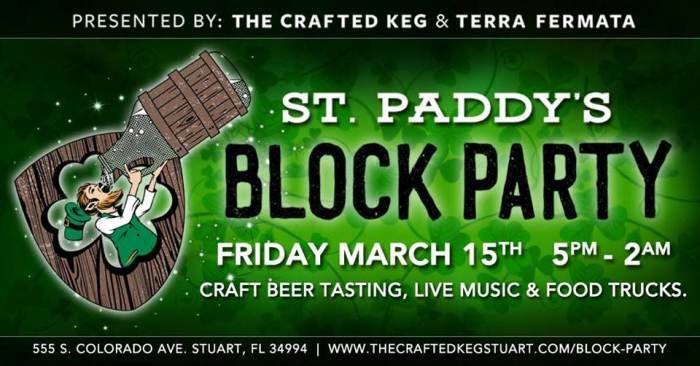 Kick off your St. Paddy's weekend at the 2nd Annual St. Paddy's Block Party presented by The Crafted Keg and Terra Fermata Tiki Bar. Stuart's unique craft beer tasting and live music festival. Traditional Irish cuisine presented by Ellie's Downtown Deli & Catering. Late night eats provided by BBQ Island Style. A portion of the event's proceeds benefit Humane Society of the Treasure Coast! Beer Fest begins at 5:00 pm with the following Breweries! Pareidolia Brewing Co., Pierced Cider, Walking Tree Brewery, Lagunitas Brewing Co, Cigar City Brewing, Oskar Blues Brewery, Due South Brewing, Barrel of Monks Brewing, Funky Buddha Brewery, Tampa Bay Brewing Company, Wynwood Brewing Company, Copperpoint Brewing Co., St.Bernardus , Lexington, Sailfish Brewing Company, Islamorada Beer Company, American Icon Brewery, HopLife Brewing Company, Side Door Brewing Company, Wicked Weed, Ballast Point Brewing Company, Golden Road Brewing, Accomplice Brewery & Ciderworks, and Wine Stream - Events.